Gold Estates Holdings has delivered some of Perth’s best-known and most vibrant residential and commercial communities. Below is a selection of our development projects over the last 120 years. Vivente at Hammond Park is a 475 lot “boutique” style community with the latest in contemporary design and innovative neighbourhood planning to create a real sense of place. Set within a beautiful natural landscape, Vivente is part of a vibrant wider community with schools, major shopping centres, public transport and freeways just minutes away, and the coast and beach in easy reach. Vivente represents the amalgamation of 7 land parcels acquired between 2004 and 2014 and at the time were used as lifestyle and investment properties. The first land was released in 2015 coinciding with the creation of the Vivente display village featuring 15 of Perth’s leading home builders. In contrast to other estates, Vivente provides a range of lot sizes from 500 square metre family lots with generous frontages to more affordable home sites for both first home buyers and downsizers. The natural bushland and open space parklands provide a tranquil setting for residents and visitors alike. Stage 2 and 3 lots are for sale. Located on Bartram Road, Success, Wentworth West is a hidden gem located close to all the outstanding shopping, school, recreation and transport amenities that are available at the Cockburn Central Regional Hub. 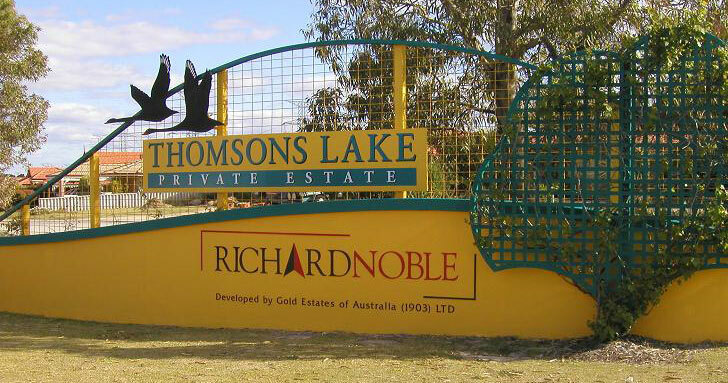 Wentworth West forms part of the original Thomsons Lake Estate incorporating the Twin Bartram wetlands representing approximately 14 hectares of natural wetlands environment. This area has undergone extensive rehabilitation and replanting as part of the development works and a significant asset to both the local and wider Cockburn community. With a total lot yield of 104 lots Wentworth West reflects a contemporary development with a range of lot sizes for large families and smaller lots adjoining the expansive open space areas. All lots have been released for sale. Eden Green is a little piece of paradise that’s just 25 minutes from the city. It has been designed with family and community in mind. Eden Green has been coordinated, designed and developed by Gold Estates Holdings and Richard Noble & Company, the same people responsible for the successful Thomsons Lake private estate. The 500 lot master planned estate in Hammond Park ideally located near the Kwinana Freeway, Aubin Grove train station and the Cockburn Central Regional Centre. Eden Green is also within easy reach to one of WA’s most important conservation wetland reserves, the Thomsons Lake Regional Park, home to over 10,000 water birds including our state emblem the black swan. Previously used for sand mining the 48 hectare undeveloped site was purchased in 2000. Development commenced in 2006 with a central 4 hectare district oval providing a central focal point for sport and family gatherings utilising playground and barbeque facilities. The development also catered for the new Success Primary School which opened in 2013. All of the land has been sold. Magnolia Gardens is part of the Thomsons Lake Estate. Purchased in 1994 from a local farming family the land was previously a working cattle and sheep property of approximately 80 hectares. This site was identified as a prime residential development adjoining the Kwinana Freeway with a commitment to the future train station. Magnolia Gardens represents over 700 housing lots together with high density sites to compliment the adjoining Aubin Grove train station. Once an area of scrubland and lakes, it has been transformed into a well-established, sought-after private residential estate home to more than 2,000 families. It is situated on either side of the Kwinana Freeway and just 20 minutes from the CBD. Originally acquired in 1986, the land was one of the pioneering subdivisions in what was at the time known as Jandakot and ultimately became the suburb of Success. The first land was released in 1993 with average prices at around $35,000 for lots averaging a “standard” 650 square metres. Ultimately the area developed into a number of precincts totalling over 1,100 lots together with what was to become the Cockburn Gateway Shopping Centre. Gold Estates successfully achieved the complex planning approvals for a Regional Centre and developed the first stage comprising of two supermarkets and approximately 25 speciality stores. Subsequently the property was sold to Perron Group who have continued to expand the Centre to what is now one of Australia’s fastest growing regional shopping precincts. Named after Mindarie Lake, an Aboriginal name first recorded by Alexander Forrest in 1874, the suburb is located approximately 34 kilometres north of the Perth CBD. After briefly being used for its limestone deposits in the early twentieth century, Mindarie was formally established in 1988 with the construction of the Mindarie Marina and hotel. In April 1978, Gold Estates of Australia purchased 298 acres of land at a cost of $597,778 for future subdivision. This land was sold in 1998 for $7.5 million. 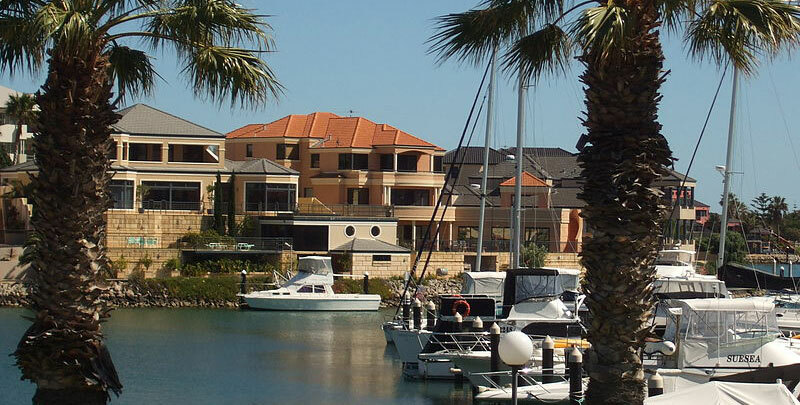 Today the median house price in Mindarie is almost $700,000. Kelmscott was one of the first towns established in the Swan River Colony. Named after Kelmscott, Oxfordshire (the birthplace of the first Anglican clergyman in the colony, Archdeacon Thomas Hobbes Scott) in 1830, the suburb is located 23 kilometres south-east of the Perth CBD. Bisected by the Canning River, the western side is flat coastal plain and to the east the suburb rises into the western Darling Scarp. In October 1972, Gold Estates of Australia purchased 58 acres of land at a cost of $171,957. Today the media house price in Kelmscott is almost $350,000. Cockburn Central is located 24 kilometres south of the Perth CBD. Cockburn Sound was named in 1827 by Captain James Stirling, probably after Admiral Sir George Cockburn (a renowned British naval officer who took Napoleon to exile on the island of Saint Helena after the Battle of Waterloo in 1815). In July 1966, Gold Estates of Australia purchased 88.5 acres of land at a cost of $81,299. The land is located near Yangebup Road, Cockburn Central. Today the media house price in Cockburn is $525,000 (source: REIWA, 2013). Named after a pioneering family, the Atwell brothers, who had owned land there for many years, the suburb of Atwell is located approximately 21 kilometres from the Perth CBD. In September 1966, Gold Estates of Australia purchased 61 acres of land at a cost of $82,248. This land is located on Beenyup Road, Atwell. Today the median house price in Atwell is $515,000 (source: REIWA, 2013). Beechboro is named after the ancestral home of Henry Brockman in Kent, England. One of the first European landowners in the area, Brockman owned parts of Swan Locations M and M1 and first subdivided the land in 1892 into farmlets. Located approximately 12 kilometres from the Perth CBD, Beechboro covers a large area and has been developed in a number of stages. In December 1964, Gold Estates of Australia purchased 56 acres of land at a cost of $84,653. This land, north-east of Morley, was named Bennett Brook Estate. Today the median house price in Beechboro is almost $400,000. Established in the 1940s and named after Henry Trigg, who was the Superintendent of Public Works in the Swan River Colony from 1838 to 1851, the suburb is approximately 14 kilometres from Perth CBD. Features include Trigg Island, the popular Trigg Beach, Mettams Pool (a snorkelling beach) and a nature reserve opposite the beach. In February 1957, Gold Estates of Australia purchased 53 acres of land at a cost of £40,406. In 1827, Captain James Stirling named Melville Water after Robert Dundas, 2nd Viscount Melville, First Lord of the Admiralty (1812-1830). The land adjacent to Melville Water became known as the Melville Water Park Estate (later Applecross) when it was subdivided from 1896. The suburb of Melville was developed in 1953, although a small pocket of land was opened up adjacent to the Canning Highway in the 1920s. Located approximately eight kilometres south-west of the Perth CBD, Melville is located on the Swan River and the majority of streets are named after people who were aboard Captain Charles Fremantle’s ship, the HMS Challenger. In April 1956, Gold Estates of Australia purchased 116 acres of land at a cost of £9,375. Today the median house price in Melville is almost $750,000. Named after Wembley, England, this residential suburb is located approximately five kilometres west-northwest of Perth CBD. Intensive subdivision of the Wembley area commenced in 1909, and originally the subdivision was regarded as part of Leederville. In 1924, the Perth City Council requested that it be renamed Wembley Park after the suburb of Greater London where the Empire Exhibition was being held at the time. The name was gazetted in 1924 and was later shortened to Wembley. On 20 July 1922, Gold Estates of Australia (1903) Limited purchased 48 blocks from The West Australian Trustee Executor and Agency Co. Ltd at a cost of £550. Known as Perthshire Estate, the parcel of land comprised 13 acres in the vicinity of Cambridge, Reserve and Selby streets. Castle Hill Estate was the name given to a parcel of land (Swan Location 69) situated in the suburb of Bicton, adjacent to the Swan River. On 14 April 1921, Gold Estates of Australia (1903) Limited purchased 241 acres from Sir Edward Charles (Horne) Wittenoom at a cost of £8,000. The land parcel was subdivided into more than 600 house lots and sold. Today the median house price in Bicton is in excess of $900,000 (source: REIWA, 2013). With a name thought to have been derived from the Norwegian barque Inglewood (its voyage was mentioned in The West Australian on 24 May 1904), the suburb of Inglewood began when land was first granted to John Gregory in 1831. Located approximately five kilometres from Perth CBD, Inglewood was regarded as part of Maylands in the early years – with Gold Estates of Australia first subdividing a section now referred to as The Avenues (the development area included land from the railway line to North Street and eventually through to Eleventh Avenue and Dundas Road). The latter subdivision was named Inglewood Estate. 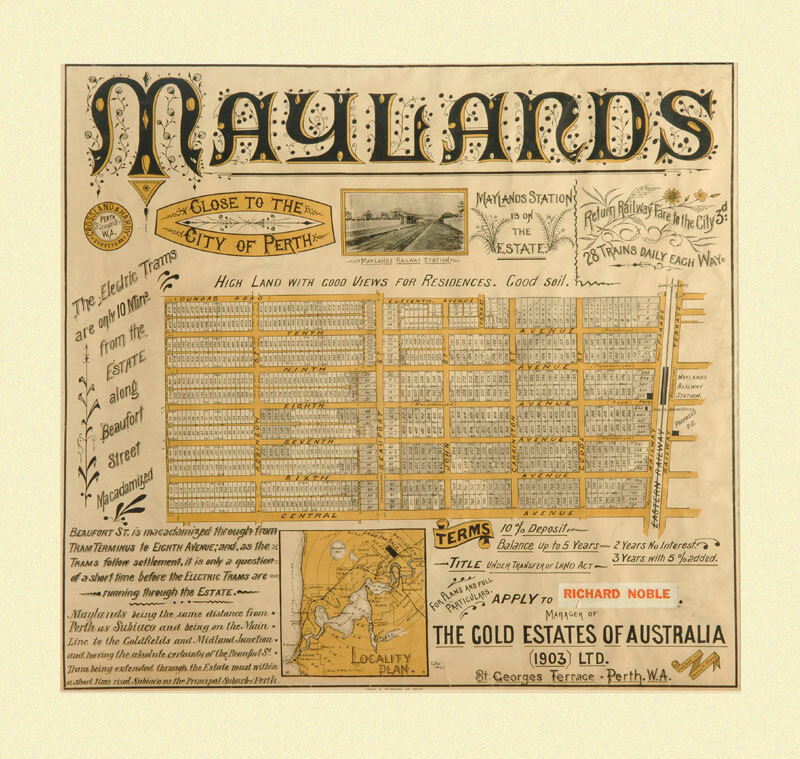 In 1919, Gold Estates of Australia (1903) Limited purchased 47 blocks averaging £7 per block. This land was subdivided as Inglewood Estate and sold as lots. Today the median house price in Inglewood is close to $800,000 (source: REIWA, 2013). Designated Swan Location T (on the eastern side of Slade Street, Bayswater), this parcel of land was owned by the Whatley family. Running from the Swan River through to the north of Morley Drive, the land was named Whatley Park by Edgar Hamer, and encompassed the suburbs now known as Bayswater, Morley (likely named after Charles William Morley, who is known to have farmed in the area during the 1860s and 1870s) and Embleton (named after early settler George Embleton who arrived in the colony in 1829 as a servant of Dr John Watley who settled in the Bayswater district). Located approximately eight kilometres from the Perth CBD, Embleton developed during the early twentieth century as a rural district, characterised by five-acre lots with a number of self-built houses. On 2 October 1912, Gold Estates of Australia (1903) Limited purchased 925 acres from Joseph Osbert Whatley at a cost of £5,550. This land was subdivided as the Whatley Park Estate and sold as lots. Today the median house price in Bayswater is over $550,000 while the median price in Embleton is $515,000 and $495,000 in Morley (source: REIWA, 2013). 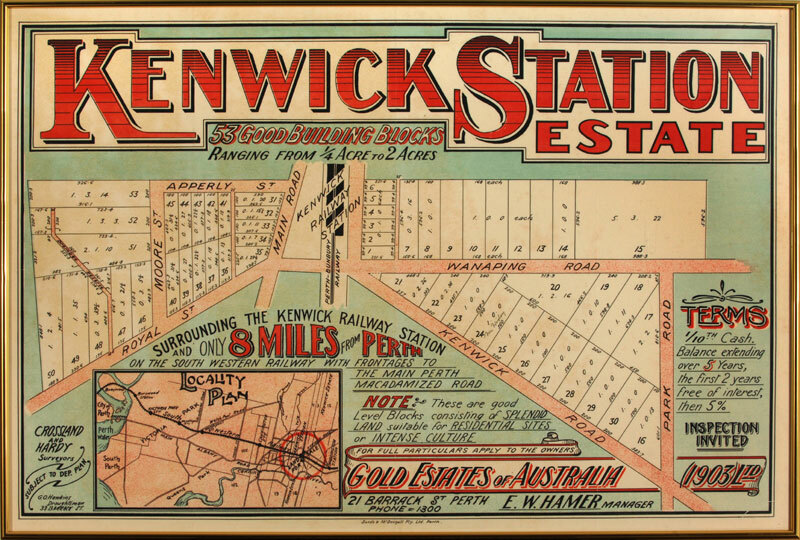 One of the early farming communities of the Swan River Colony, Kenwick is a mixed residential, light industrial and semi-rural suburb approximately 18 kilometres south-east of Perth CBD. A large portion of the suburb is composed of remanent agricultural land organised as small-holdings of several acres, as well as relatively pristine native wetlands. Today the median house price in Kenwick is over $340,000 (source: REIWA, 2013). Bayswater was the name of a property in the vicinity of Slade Street that was advertised for sale in the Morning Herald on 31 July 1885 and purchased by a Mr Gribble. Presumably named after the London suburb of the same name, it is located approximately six kilometres north-east of Perth CBD. Situated along the northern side of the Swan River, the suburb’s development began following the opening of the Perth to Midland railway line in 1891. On 9 September 1904, Gold Estates of Australia (1903) Limited purchased 995 acres of land from John Blyth and Godwin George Crespin at a cost of £9,000. The land (known as Swan Location V) ran from the Swan River northwards to where Mt Yokine Reservoir was later built. This land was suitable for a mix of residential purposes as well as market gardens and farming activities. The part south of the railway line was named the Oakleigh Park Estate. In 1910 Gold Estates also opened the Subreption Estate, north of the railway line in the vicinity of May, Lawrence and Arundel Streets and the Strand. Lots in both the Oakleigh Park and Subreption estates were sold. The median house price in Bayswater today is over $550,000 (source: REIWA, 2013). Named in honour of Sir Arthur Lawley (Governor of Western Australia from May 1901 to August 1902), the leafy inner-city suburb of Mount Lawley is four kilometres north-east of Perth CBD. 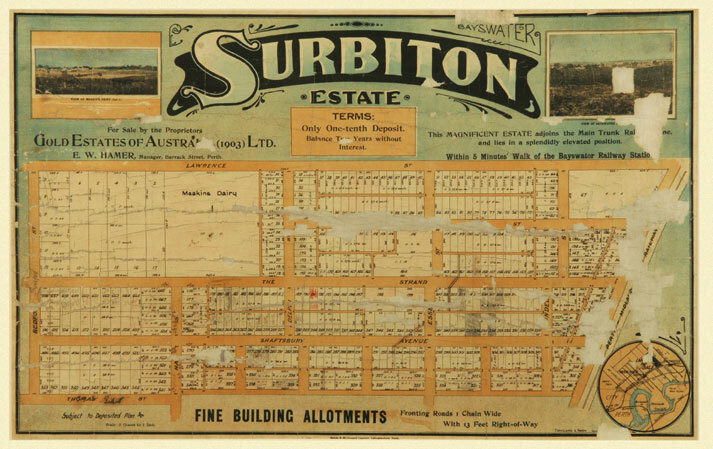 In 1865, Perth Suburban Lots 140 to 149 were designated and between 1889 and 1901 a number of estates were established in the area. The area of Mount Lawley was formally proclaimed in 1901. Strategically set between the northern bank of the beautiful Swan River and the Midland rail line, Maylands is 4.5 kilometres north-east of Perth CBD. 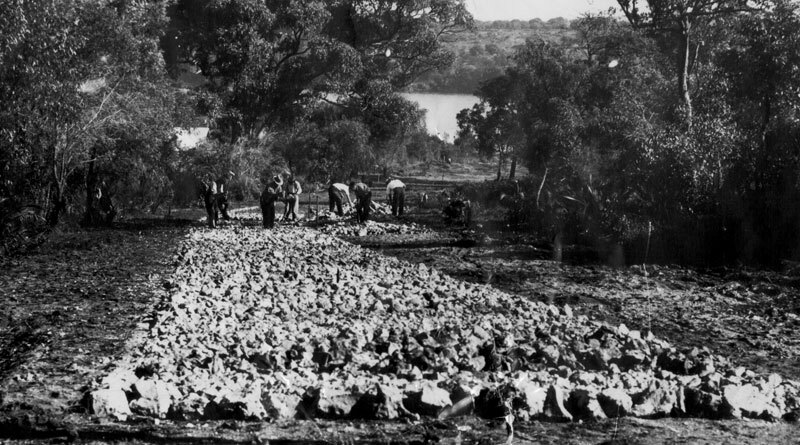 The railway line was originally built in the 1880s and the suburb was developed during the 1890s (the colony’s first farm, Peninsula Farm, was established on the banks of the river in Maylands in 1830 and Tranby House was built on the site in 1839). On 10 December 1903, 180.5 acres of land was purchased by Gold Estates of Australia (1903) Limited at a cost of £150. Today the median house price is in excess of $1 million in Mount Lawley and more than $600,000 in Maylands (source: REIWA, 2013). On 9 September 1895, Charles Ernest Deeley (as Trustee for Gold Estates of Australia) purchased 668 acres from Emma Amelia Slade at a cost of £5,100 (this land was part of Swan Location Y). 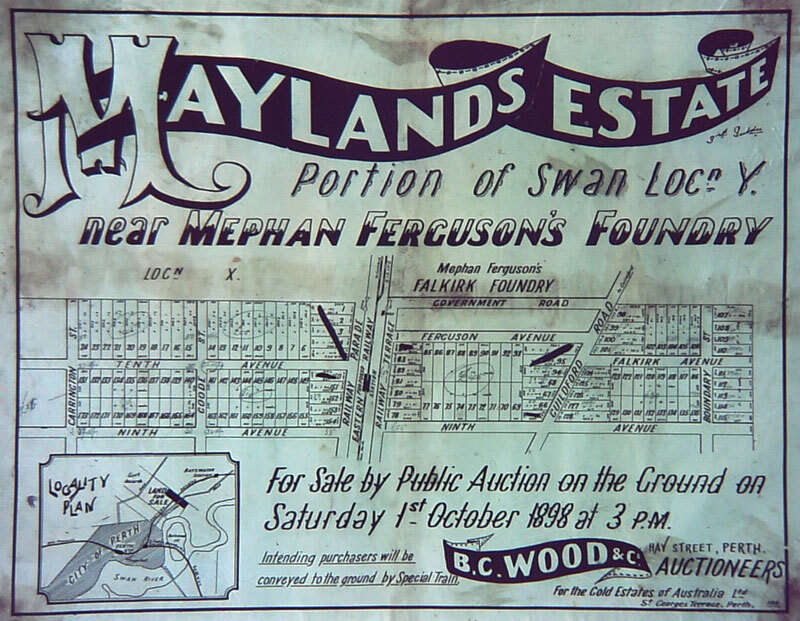 Known as the Maylands Estate (and also referred to as the ‘Pineapple Estate’) the parcel of land was managed by Edgar Walter Hamer. Situated within three kilometres of the Perth Town Hall and one kilometre of the city boundary, the site adjoined Mephan Ferguson’s foundry and today comprises the suburbs of Mount Lawley, Inglewood, Maylands and Bayswater. The land was transferred to Gold Estates of Australia (1903) Limited on 20 September 1903. Purchased for less than £100 per acre, the holding was subdivided and sold in lots. Today the median house price is in excess of $1 million in Mount Lawley and more than $600,000 in Maylands (source: REIWA, 2013). Menzies is a town in the Goldfields Region of Western Australia. Located some 728 kilometres east-northeast of Perth, gold was discovered here in 1894. 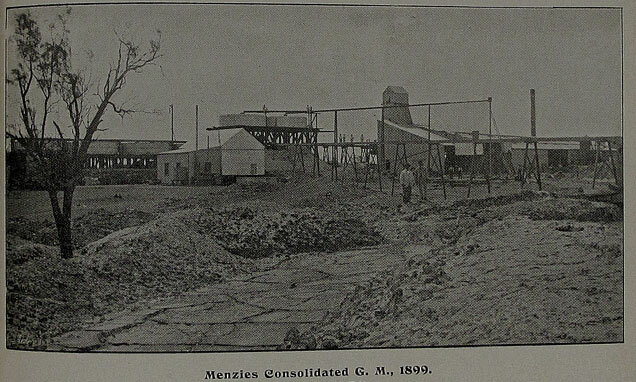 By 1900 Menzies was a booming gold town with more than 10,000 people living in the area (primarily miners). Ten town lots were purchased by the Company in October 1895 for $7,500. 6 were on sold at a profit of nearly 100%. 4 lots were still held by the company in 1902. Two were sold at a loss and two are still currently held. The original titles on display at the Head Office. The company purchased the holding with the intention of on-selling the lots for the construction of miners’ houses. By 1902, six of the lots had been sold, with some realising £1,000 – representing almost 100% profit on the average lot cost. Two of the lots were sold at a loss.